Madeline Docimo ’15 wanted to explore why fewer high school students are studying music, see what communities are currently doing to solve the problem, and work to find new solutions to participation issues. With Chad West, an assistant professor of music education, Docimo researched existing efforts to advocate for music education. They discovered that current strategies—which emphasize how music can make you better at math or improve your SAT scores—are not effective. “Although the efforts win funding in the short term, they’re not sustainable for the future of music programs,” Docimo explained. She then worked with Radio Cremata, assistant professor of music education, to identify the characteristics of a classroom environment that would make it easy for students to explore music. Docimo examined a variety of philosophies and programs, and she determined the ideal characteristics of a strong high school music program. For instance, she found that students got more out of music programs when the music they learned about was more like what they listened to outside of school. 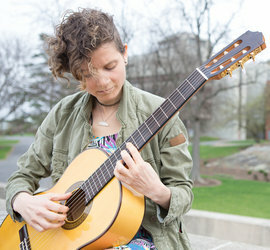 She came up with a curriculum emphasizing present-day music and creating a more open classroom environment, which she believes could solve both enrollment and funding issues. “This way, more students are invited to make music in the schools, and advocating for a program that is so popular among students becomes unnecessary,” Docimo said. Docimo is hoping to have her research published in the Music Educator’s Journal. She said she enjoyed presenting at the Whalen Symposium because it gave her the chance to synthesize ideas and research into her own conclusions. "It gave me a chance to find my voice,” she said.